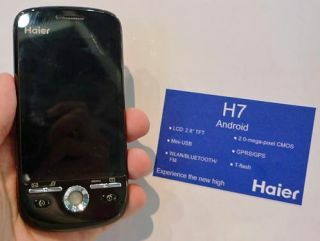 The latest name to the Android game is a Chinese one, Haier, which launched its H7 phone at CommunicAsia 2009. The new phone, which was only a mock-up on display, will apparently launch in September, although apparently only in France. It will be packing the Android 1.5 Cupcake upgrade, although should Donut, AKA Android update 2.0 with a whole host of whizzbang features, be ready then it will stuff that under the hood instead. In other spec news, the phone has a slightly small 2.8-inch touchscreen, a 2MP camera, GPS, Wi-Fi, expandable memory through microSD and, well, that's pretty much it. The chassis looks ever-so-slightly / very like the HTC Magic, with trackball, thin function buttons and call / terminate placed in very similar positions. However, the phone is going to be slanted heavily for the budget masses, coming in at just $150, around £90, according to the stand hosts.